Last night, late night comedian Samantha Bee hosted her own version of the annual White House Correspondents’ Dinner. The event was billed as a celebration of free press and served as a fundraiser for the Committee to Protect Journalists, reportedly raising $200,000 for the organization. Bee’s aptly titled “Not the White House Correspondents’ Dinner” featured comedians, pre-recorded sketches, and more than a handful of queer moments. Check out a few of the highlights below. 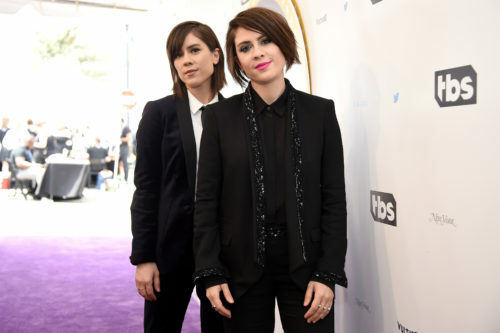 Fellow Canadians and queer-twin pop-rock duo Tegan and Sara made an appearance on the red carpet. “Our role is to drink and celebrate with all the amazing journalists, who are doing great work in this terrifying time,” Tegan Quin told the Washington Post. Tegan and Sara attend Full Frontal With Samantha Bee’s Not The White House Correspondents’ Dinner at DAR Constitution Hall on April 29, 2017 in Washington, DC. During a segment in which comedians roasted Trump in quick succession, lesbian comedian Cameron Esposito dons “Trump drag” to poke fun at the president tape-up tie, with a little help from her partner in comedy and life, Rhea Butcher. In a Man in the High Castle-inspired dystopian in which Ted Cruz is president/overlord, George Takei offers Samantha Bee a video that holds a vision of another world — one where Hillary Clinton won the presidency instead of Trump. In a pre-recorded bit, Bee roasted past presidents in period-appropriate attire and personas. When it got to Ronald Reagan, Bee delivered a burn on his dangerous disregard for people with HIV/AIDS.